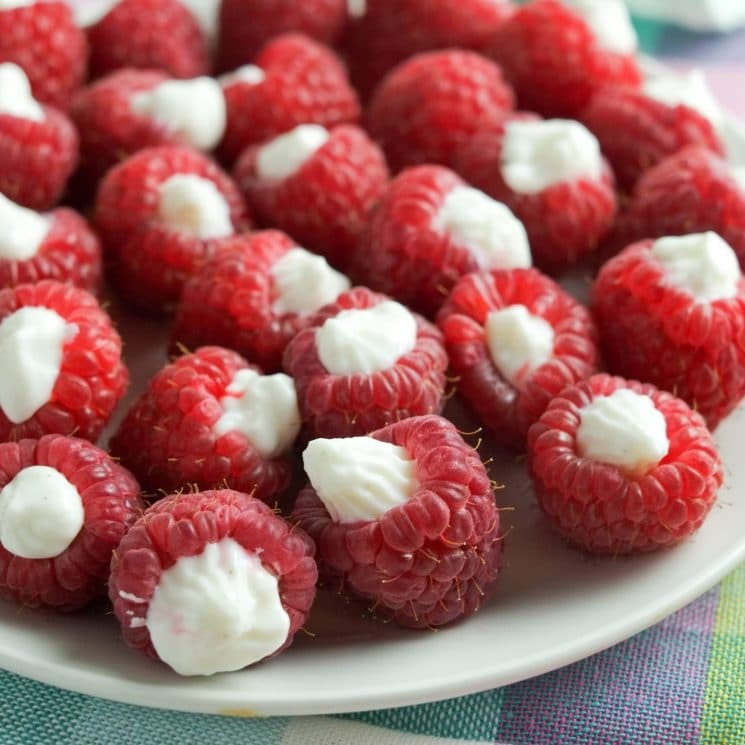 Summer is just around the corner, which means raspberry season is too! Fresh raspberries are the perfect snack for little fingers, and we made them extra special by filling them with frozen yogurt. 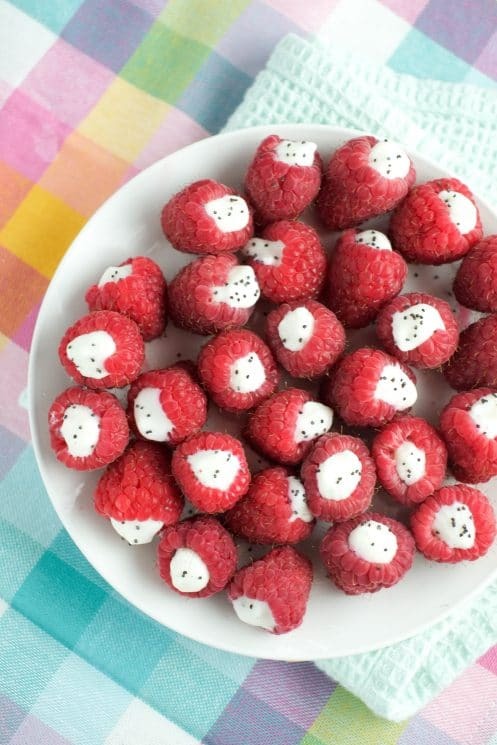 These frozen yogurt raspberries are so simple anyone can make them! Raspberries are definitely one of my favorite fruits. We have some neighbors that have a huge raspberry patch and sell us raspberries every year at a great price. I can’t wait for raspberry season to be in full swing! 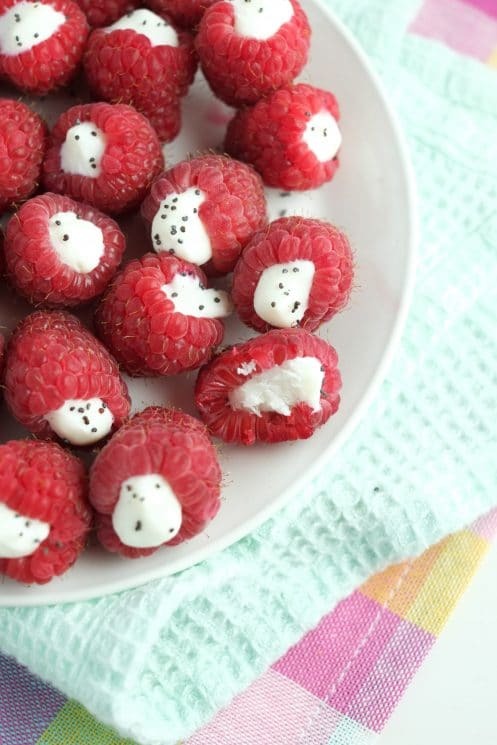 Raspberries by themselves are delicious, but this is a fun twist for a summer snack. This snack seems fancy, but it’s actually really simple! But kids love these frozen yogurt filled raspberries and feel like they’re a treat. All you will need is some yogurt (we used Greek), a pastry bag (you can also use a Ziploc with the corner cut off, and some raspberries. Fill your pastry bag or Ziploc with your yogurt. Then put it in the freezer for a little while so it hardens just a bit. We like using plain Greek yogurt and adding honey to sweeten so that it’s not too full of sugar, but any yogurt will work. What fun flavor combos will you come up with? 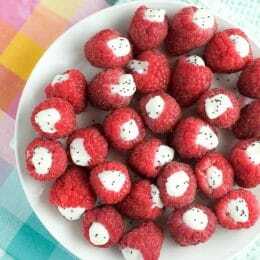 Coconut filled raspberries? Mango filled raspberries? Raspberry filled raspberries? The amount of time you freeze your yogurt will depend on how much you freeze at once, what kind of yogurt you use, and how well your freezer works. I froze mine for about 45 minutes, but you’ll want to check on yours every 10 to make sure it doesn’t completely solidify. Once you feel like it is frozen up a bit, but not solid, put a squeeze in each raspberry. Mine melted a fair bit while I was holding it, so you may want to freeze the yogurt just a little longer than you think necessary. 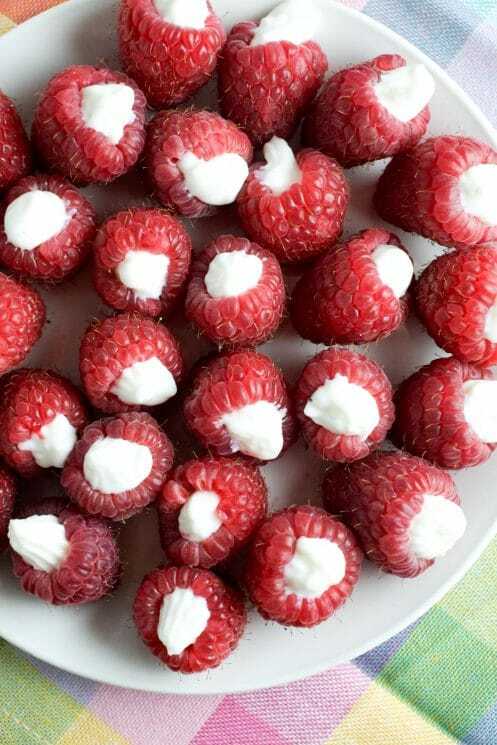 Filling the raspberries is easier than it might seem. It took about 45 seconds – which is good because my girls were staring these down the entire time I was doing it. We also topped some with poppy seeds for “sprinkles” just for fun, but this is totally optional. Kids love sprinkles though! And voila – done. Beautiful, tasty and packed with nutrients. For a little festive flare, serve them up with some blueberries as a fruit flag. It is a good thing they only take 45 seconds to make, because they will also be gone in about 45 seconds. My kids loved these…………obviously………..just a little bit. 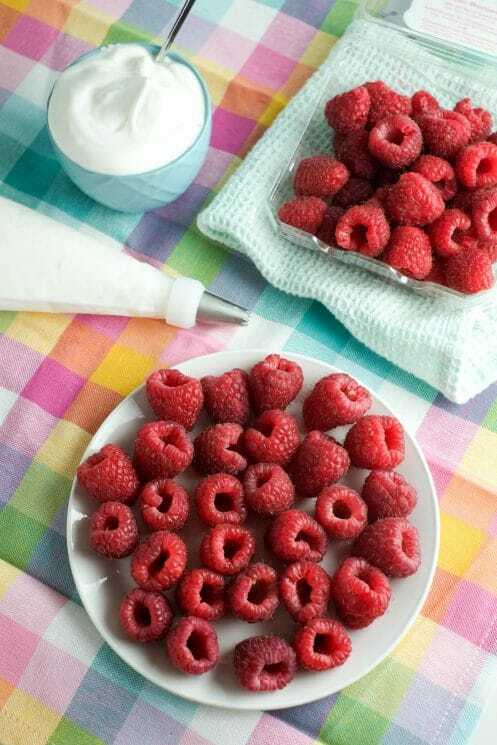 What’s your favorite way to eat fresh raspberries? Top with poppy seeds for “sprinkles,” if desired. These look great! 🙂 Thanks for the amazing summer idea! This is so simple. I’m sure my niece would love to have this.Thanks for sharing. Hi! Do these need to be eaten right away? Is there a way to make these and store them somehow to eat at a later time? Can youake these ahead of time and put in the fridge? Or would the yogurt unfreeze enough to seep out? Could you make these a head of time? How would you recommend storing them? Would they do best in the freezer? They work fine this way. It won’t be frozen, but Greek yogurt is thick enough that it won’t seep out. You can definitely freeze them, I haven’t tried it this way. The raspberries I used were fresh and not frozen, but I think they would be good frozen also. Everything posted made a bunch off sense. But, what about this? I ain’t suggesting your content is not solid., but what if yoou added something that grabbed a person’s attention? 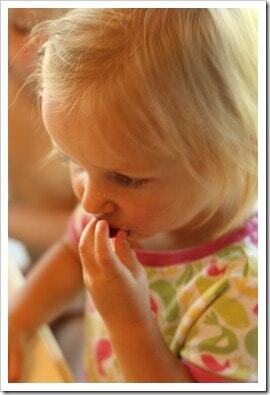 I mean Homemade Fruit Snack: Frozen Yogurt Raspberries | Recipes is a little boring. two to grab people excited about everything’ve written. Just my opinion, it might bring your posts a little livelier.